We are now over that. 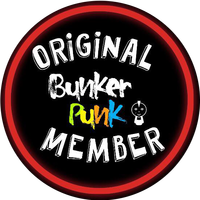 Let’s get to the awesomeness that is this week’s entries! 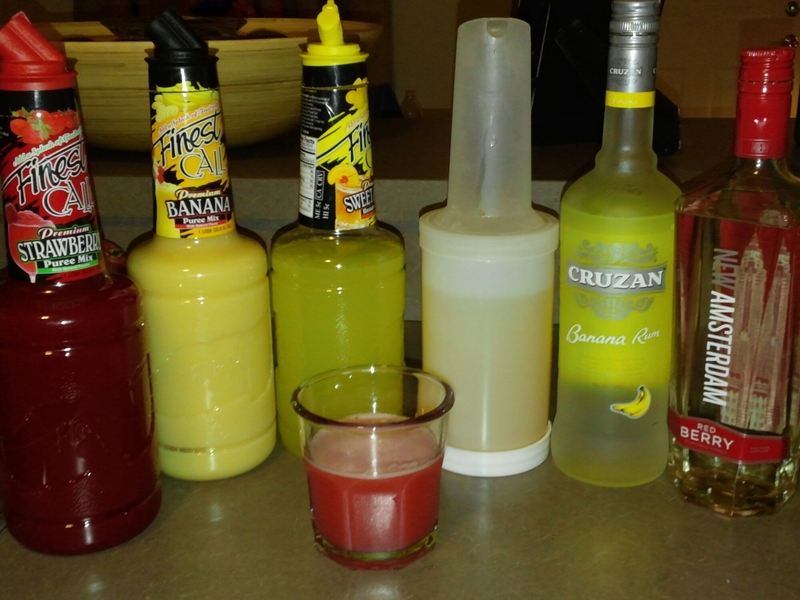 Bar Lab 101 had us with a video, which is posted on facebook and you tube on how to make infused vodka. 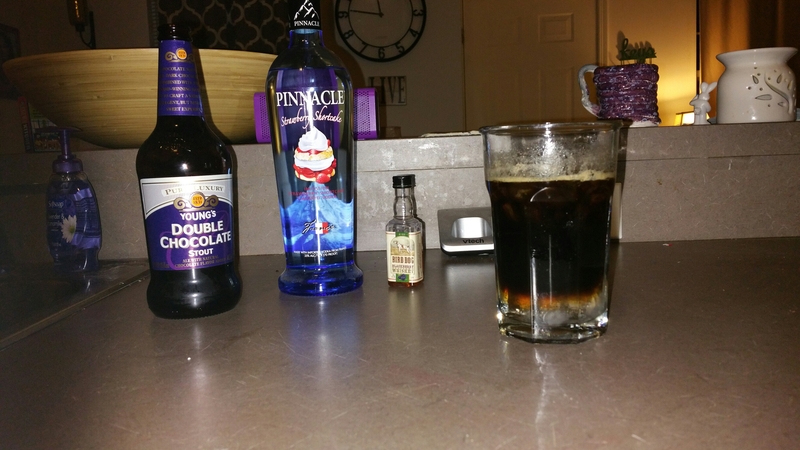 Like I mentioned, go back to our 25 days of holly days, and one of the post I wrote on was about homemade gifts, which included the awesome christmas infused vodka. It’s slightly different, because the christmas infused vodka, you don’t have to strain anything out of the mason jars. In this case, depnding on the cake, you may or may not have to strain the cake from the liquor, it just depends on the cake. In this case, it can go either way. As you see, I took a slice and a half, and added it to the jar. You fill up the jar with vodka, in this case, I chose whipped pinnacle vodka. For the next couple days, I’ll shake the jar every time I go into the kitchen. It’s important to remember that, so the the flavors don’t settle to the bottom. As the days go on, you’ll begin to see the vodka get cloudy. Don’t worry, it’s just the cake. As long as the lid is tightly on the jar or container your using, you’ll be fine. 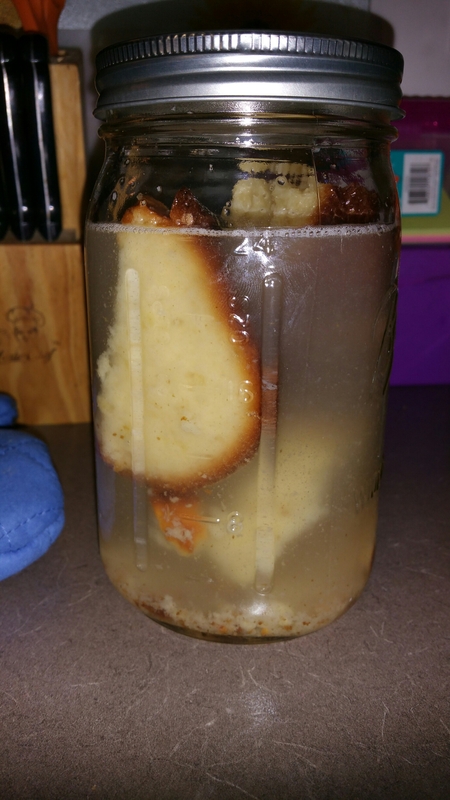 By day three(at the earliest), strain the cake out of the liquid(if you need to) into another jar, and BOOM! Infused vodka do as you wish. 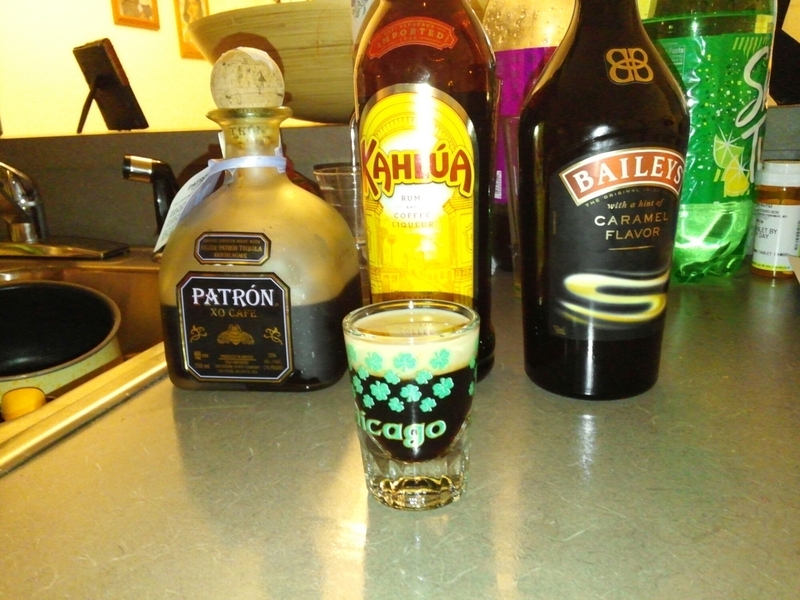 Now, as I mentioned last night, I chose six of my favorite drinks since that was the theme this weekend! I can guarantee you these are going in the book as well. 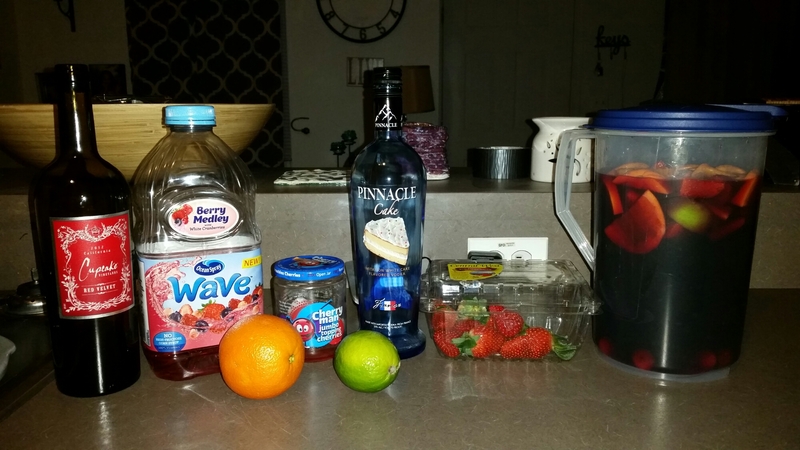 My second pick was the Single Ladies Sangria. I loved this because of all the flavors that went into the drink. I follow it with water because of the sweet flavors, but it’s great girls night out or girls brunch drink. Great with a dessert dish. I keep a little stash on hand when I just want to chill out and watch tv. My first drink I ever made goes on this list too. Not because it was my first, but even still to this day, it tastes so good. My Autumn Breeze. It’s real simple, because I was afraid to try out things at first. LOL. Very simple spiced island malibu rum and apple cider. I may tweak the recipe and add things but it’s really tasty, and can be served warm or on the rocks. Versitle and easy. You know that’s my cure to life, for the most part. I then decided I can’t make a list without shots! My version of a storm shot was awesome. Spicy and creamy. Not too strong, but strong enough that if you have too many, you’ll think you can create thunderstorms! The flavors definity meshed well, and have an awesom balance to being feminine but still hanging out at the pub. Also she’s one of my favorite superheroes. Just saying. I had to add te buenaventura to my list. 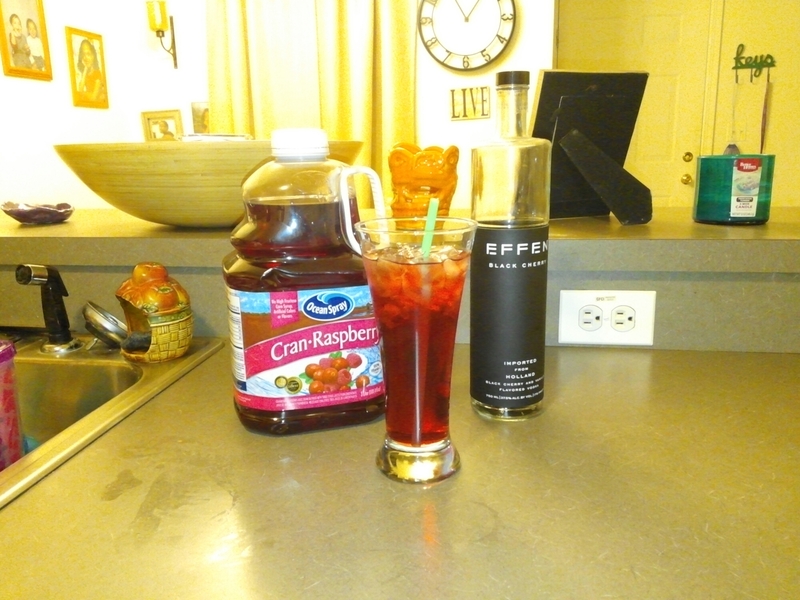 Another simple drink and tasty since it has cran-raspberry juice! It akes me back to the beach and watching the ocean come in. It is kind of tart, but the black cherry vodka lessens the blow on the tart taste overall. My last choice is my Strawberry Banana Martini. This one can sneak up on you, but is very good. I really like this one because of the strawberries and bananas to be honest. You also can’t really taste the liquor in the drink. It’s classy, sweet, and damn good. It’s not too girly that a guy would enjoy it too. Hola! I thought I’d visit you here! I have some questions. First, where are the exact drink recipes for people like me, who don’t have a clue how to make these drinks. Like, what exactly IS a storm shot? Is this more for people who know their drinks? And what IS that infusion? Are you making birthday cake vodka? Your blog is bee-yoo-tiful. I’m so glad I stopped in. See you on Facebook, gorgeous! I know nothing. Teach me, oh wise one! !